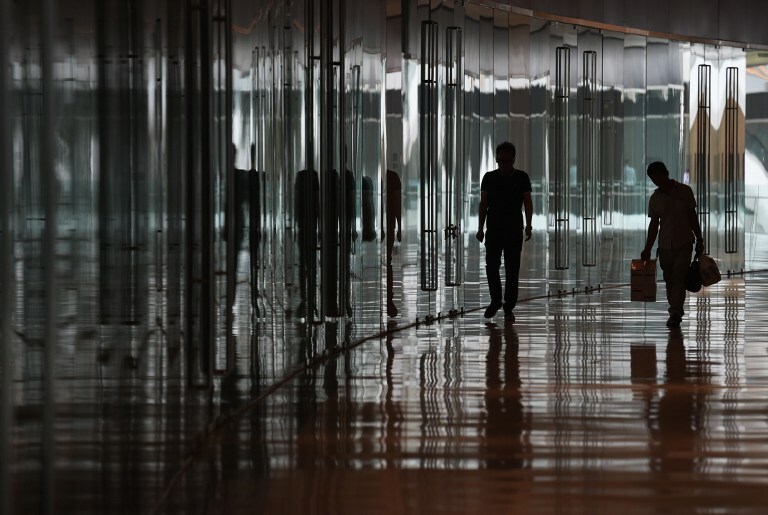 Two men walk past a row of empty stores at a recently built shopping mall in Beijing, June 26, 2014. In China, where economists often encounter extraordinary statistics, the number of empty homes has reached astronomical heights. This month, a national survey by China's Southwestern University of Finance and Economics estimated that nearly 49 million residences in urban areas have been left unoccupied, based on a vacancy rate of 22.4 percent last year. The results reported by The Wall Street Journal and other publications mean that the number of dwellings sitting empty in China could house the entire populations of leading U.S. cities including New York, Los Angeles and Chicago combined. The survey's estimate is far higher than the 10.2 million empty units cited in a study by Credit Lyonnais Securities Asia Ltd. in May. The new survey contacted 28,000 households in 29 provinces, the South China Morning Post reported. Despite the enormous estimate, the comparison with the United States may be of limited value in light of vast differences between the countries. "We don't have the kind of rural-to-urban migration that China has," said Harvard University economics professor Dale Jorgenson. "So, it's really not surprising given the size of China's population that you get a number like that." But the high vacancy rate of sold homes is a sign of the scale of China's building boom and the troubles that a downturn may cause. The vacancy rate has been rising while the proportion of urban families seeking first homes has been falling, said the study by the Survey and Research Center for China Household Finance at the university in Chengdu. In 2011, the empty-home share in urban areas stood at 20.6 percent, while vacancy rates have climbed as high as 27.6 percent in second and third-tier cities since then. Also in 2011, 28.2 percent of families in the survey wanted to buy a first home, compared with just 22.2 percent in the first quarter of this year. Although the trends are both negative for the market, the real trouble may be that they are moving on different tracks, since vacancies are largely among multiple dwellings purchased by more affluent owners for investment. These empty units are likely to be priced too high for first-time buyers, highlighting the gap between rich and poor. The survey found that 21 percent of city dwellers now own more than one home, China Business News said. In addition, the survey estimated that 3.5 million residential units were left unsold last year. Despite months of concern over the decline in the housing market, there has been little consensus about the extent of the effect on the economy. So far, the government has shunned major moves to ease credit or bail out indebted developers who have been stuck with unsold units as property fever cools after years of price growth. Even without a glut of empty homes, the housing sector may simply be following a natural course for a market that has been seriously overbought. "That's why the Chinese authorities have tried to rein this in," said Jorgenson. "They realize that this housing boom has been a little out of control, but this is something that's on their radar screen and, from their point of view, they're well aware of this." Official analysts have tended to reflect awareness rather than alarm. "Based on our research, the risks from the property market are still controllable," said Li Yang, vice president of the Chinese Academy of Social Sciences, quoted by the official English-language China Daily on June 14. Prominent property developers have been more pessimistic. "I think China's property market is like the Titanic and it will soon hit an iceberg in front of it," said Pan Shiyi, chairman of Soho China Ltd., in comments reported by China Business News in May. Official reports continue to send signals that both home sales and prices may be on the edge of a slide. In its latest sample, the National Bureau of Statistics (NBS) found price drops in 35 of 70 major cities in May, compared with just eight in April. Increases were recorded in 15 cities, down from 44, the official Xinhua news agency said. The slight April-to-May price dip of 0.15 percent was the first in over a year. A steeper stumble in sales was seen in Beijing, where transactions in the first five months of the year plunged 34.9 percent, according to the municipal bureau of statistics. The volume of new home sales in surveyed cities fell 9.2 percent in the five-month period, while the value slipped 10.2 percent, the NBS said. Under those conditions, the huge inventory of empty homes may serve as a further drag on the market. Even if prices of unoccupied homes fall to within a more marketable range, the volume far exceeds the estimated demand of 32.5 million units from first-time buyers and upgraders, the household survey said. In recent weeks, reports have suggested the government may back away from controls on investment in multiple homes that it ordered last year. An easing may help to sop up local surpluses of apartments, but it is unclear whether it would have any effect on vacancies. Despite the cautionary signals, developers have kept building, investing and relying on the government's ambitious urbanization plan that would shift some 100 million rural residents to cities by 2020. In the first five months, investment in housing development rose 14.6 percent, down only slightly from the 16.6-percent growth rate a year earlier, Shanghai Daily reported, citing NBS data. For the time being, the market appears to be both overpriced and ahead of itself. "Fundamentally, they've got to slow down the construction process and allow this inventory to be taken up by people who are going to live there. That's something that's going to take a while," said Jorgenson, estimating that an adjustment could take eighteen months to two years. The impact on multiple homeowners appears open to question. The household survey estimated that a 30-percent drop in prices would put 11.2 percent of vacant homes "underwater," with debt exceeding equity. At that rate, some 5.5 million units would have to be sold at a loss. The housing stock may also continue to swell at the lower end, thanks to the government's goal of adding 7 million affordable housing units this year. In early June, the Ministry of Housing and Urban-Rural Development said construction had already started on 2.86 million units. While the vacancy issue may appear to be a problem primarily for developers and property owners, it is linked to a series of challenges for China as it struggles to get industrial overcapacity, pollution and energy waste under control. Estimates of the property sector's share of China's economy range from 12 to as much as 25 percent, but the impact of building millions of unused residences may be harder to assess in terms of environmental damage from unnecessary investment in industries like cement and steel. "It's all part of the same picture," Jorgenson said. "China has a lot of surplus capacity. There's been excessive investment and this is only gradually being taken up by growth in consumption." "You can't have an economy in which you're investing 50 percent of the national product without getting a lot of excess capacity in every dimension, and that's exactly what's happened in China," he said. Well, that makes sense because it's also a country filling up with empty people. I hope this site is not sponsored by the U.S. government. It is very laudable to be bringing free speech to every corner of the world. But, I presume the author and his institution have objections to the political leadership of China. His knowledge of economics and financial markets is limited. He gives you many facts. The problem is that none..none of them have anything to do with whether China has a housing bubble. First, China does not have a housing bubble. The author is bringing his experiences in Western and U.S. real estate markets and applying them to an economy where that model is not appropriate. China's leaders are following the developmental state model and not a western neo classical model of economic development. In simple terms, that means that when a developer sells a condominium in China 40% to 50% of the selling price goes to the state. Real estate development in China, like autos, is subject to enormous consumption taxes which fall on the top 20% of the population. Since the State is selling the land to the developer and determining the price the quantity and pricing of new housing is determined roughly by the State. Since China has a growth rate goal of roughly 7% to 8% for 2016 and wages and benefits are rising by almost 10% yearly the State has to create infrastructure in advance of its need. This is similar to what Amazon does in the U.S.
Ninety percent of the empty projects of two years ago are now filled and since large downpayments are required, as the author states, it would take a drop of 30% for 11% to be under water. I presume he pulled this stat without thinking. Good luck betting against China and their economy. b) immigrated en masse to the US, Australia and Canada.